I discovered the Love Inspired line of books a year ago and approached it very skeptically. I typically like longer trade-length books and steer clear of novellas. What I found, however, were stories full of faith wrapped in a small package. I was reminded of the old adage that I should never 'judge a book by its cover'- or size. These authors have hearts for the Lord and their beliefs shine through their stories. Quick and easy reads, these books are the perfect size and price to throw into a beach bag and take to the lake or pool for an entertaining afternoon read. Susan sent me some info on her book and a link for readers to enter for a chance to win an Amazon gift card. Check it out below, you can learn a little more about Susan and read an excerpt from her book. 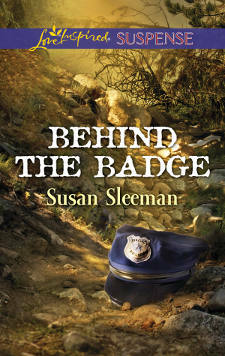 Enter to win a copy of Susan Sleeman's Behind the Badge and a $50 Amazon gift card! Susan Sleeman here. 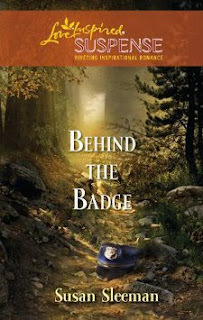 Behind the Badge, my second romantic suspense book for Love Inspired Suspense will release on June 6th and in honor of all of you, the readers, I am hosting a special contest on my website for the month of June. Let’s face it. Without you, the wonderful readers, books would not exist and I wouldn’t be able to wake up looking forward to a job that is fresh and exciting each and every day. Praise God for this incredible opportunity! Now back to the contest. All you have to do is read the excerpt below then go to my WEBSITE and answer the following question. That's it. You're entered to win. If you'd like to sign up for my mailing list to learn of other contests in the future you can do that at the same time, too. Full contest rules are on the entry page. Remember only one entry per person. QUESTION: What item let Russ know the bike was street legal? SUSAN SLEEMAN is a best-selling author of romantic suspense and mystery novels. She grew up in a small Wisconsin town where she spent her summers reading Nancy Drew and developing a love of mystery and suspense books. Today, she channels this enthusiasm into writing romantic suspense and mystery novels and hosting the popular internet website TheSuspenseZone.com. Her books include Nipped in the Bud, High-Stakes Inheritance, Behind the Badge, and The Christmas Witness. Also watch for the first two romantic suspense books in her Justice Agency series coming from Love Inspired Suspense in 2012 and featuring a private investigations firm specializing in helping those who traditional law enforcement has failed. Susan currently lives in Florida, but has had the pleasure of living in nine states. Her husband is a church music director and they have two beautiful daughters, a very special son-in-law and an adorable grandson. To learn more about Susan visit her website, Facebook , or Twitter. A killer is threatening the life of rookie cop Sydney Tucker's sister-unless Sydney turns over evidence from a drug bust. But she doesn't have the evidence. Not that the thug believes her. Now she and the sibling in her care are under the watchful eye of Logan Lake police chief Russ Morgan…but will his protection be enough? Deputy Sydney Tucker hit the cold ground, a jagged rock slashing into her forehead on the way down. She reached for her service weapon. Came up empty handed. She'd stopped after work to check on the construction of her townhouse and left her gun and cell phone in the car. "What're you doin', man," a panicked male voice traveled through the night. "No! Don't shoot! We can work this out." "I know you're here, Deputy Tucker," a male voice, disguised with a high nasally pitch, called out. "We need to talk about this. C'mon out." Dixon? Did he mean the man she arrested for providing alcohol to her teenage sister and for selling drugs? Was that what this was about? She wrenched around to determine his location. A protruding rock caught her foot, catapulting her forward. She somersaulted through the air. Her knee slammed into the packed earth and she crashed down the hill. Wrapping arms around her head for protection, she came to a stop, breath knocked out of her chest, lying flat on her back in a thick stand of weeds. "So you want to play it that way, do you Deputy? Fine. Just remember, you can run, but you can't hide. I will find you. This will be resolved one way or another." His disembodied laugh swirled into the night. She was easy prey. Even with her bulletproof vest, a few rounds fired in her direction would take her out. She had to get up. Sydney uncurled and came to a standing position. Taking a few halting steps, she tested the pain. Nearly unbearable. But she could-no she had to do this for her sister. She twisted, arched her back, pushing against arms like iron bands. "Relax Sydney, it's Russ Morgan," Logan Lake's Police Chief whispered, his lips close to her ear. Russ Morgan? What was he doing here? "Sorry about the hand." His tone said she was nothing more than a stranger instead of someone she'd known for years. "I didn't want you to alert the shooter with a scream. I'm gonna remove my hand now. Nod if you understand me." "Once the shooter rounded that curve, you would've been a goner," he whispered while still firmly holding her. "Good thing a neighbor reported gunshots." Sydney started to shiver and breathed deep to steady her galloping pulse. Air rushed into her lungs. She was alive, but barely. No thanks to her own skills. "Yes." She willed her body to stop shaking and eased out a hiss of disappointment in her performance as a deputy. "How long have you been here?" "I don't know," she whispered back. "I just stopped to check on the construction of my townhouse on my way home from work." She felt Russ's breathing speed up, upping her concern and washing away the brief blanket of security his arms provided. Adrenaline urged her to move. To keep from panicking, she focused on Russ's unwavering weapon. The shooter spun sending gravel flying then headed up the path. As his footsteps receded, she tried to relax taut muscles. The warmth from Russ's body helped chase out her fear and the chill of the night. Thank God Russ was here. If he hadn't come. Not only was Russ an officer from the city police force-a team often in competition with the county sheriff's department where she worked-but a man she'd had a crazy crush on in high school. A man whose rugged good looks still turned women's heads. "I know this's awkward," he whispered, "but hang tight for a few more minutes. We need to wait for him to head back down the hill." She wanted to protest and suggest they flee now, but not Russ. He thought clearly. Taking off now gave the killer the advantage of higher ground, making them moving targets. They'd have to sit like this until he passed them again. They pounded closer. The shooter moved at a quick clip this time as if he thought she'd gotten away and he was fleeing. Or maybe he was heading to her car to lay in wait for her. "You have a backup?" He referred to a back up gun officers often carry. "Then wait here." He gave her the hard stare that'd made him famous around town and crept toward the path. She leaned against the boulder and wrapped her arms around the warm circle on her waist where he'd held her. Without his warmth, she couldn't quit shaking. The reality of the night froze her inner core. She should listen to Russ. Lay low. Wait until he apprehended the killer. Not for everyone, but for an officer of the law, letting a shooter escape without trying to stop him wasn't an option. Even if that shooter had her in his sights, she'd make her way to her car for her gun and help Russ stop this maniac before he hurt anyone else. Near the ditch, Russ came to a stop and fought to catch his breath. Taillights on a mud splattered dirt bike roared up the trail. He'd warned the suspect to stop, but short of shooting him in the back, Russ couldn't stop him from fleeing into the dark. At least he'd accomplished his primary objective. To protect Sydney and keep her alive. Now he needed to alert his men and the sheriff's office to the suspect's whereabouts. He lifted his shoulder mic and ordered a unit from his office to stake out the end of the trail for the motorcycle and an ambulance in case Dixon survived. Then he asked dispatch to patch him through to the county sheriff's department to make sure they knew he'd taken charge of the scene so none of their hotshot deputies arrived with the hope of usurping control. He turned on his Maglight and headed up the hill. The beam of light skipped over gravel and lush plants lining the winding path. Midway up, rustling brush stopped him cold. He'd left Sydney higher up. Nearer the lake. He flipped off his light and sought protection behind a tree. His breath came in little pulses in the unusually cold air for a typical Oregon fall. Adrenaline with little time to ebb away came roaring back, but even as the noise grew louder, he resisted the urge to take action. Maybe it was Sydney. The Sydney he used to know wouldn't have listened to his directive and stayed put. She'd trounce down the hill, her chin tilted at the same insolent angle as when he told her he didn't return her crazy crush her freshman year of high school. Not that he'd wanted to send a beautiful, lively girl like her away. He could easily have dated her, but he was four years older, in college. With their age difference, it wouldn't have been right. Bushes at the path's edge shook then parted. Slowly, like a sleek panther, Sydney slipped out. He watched until she stood tall on those incredibly long legs he'd admired since she was sixteen before lowering his gun and aiming his flashlight at her. She jumped. Peered up at him, an impudent look planted on her face. This was the Sydney he'd known as a teen and heaven help him, in less than thirty minutes, she'd sparked his interest again. "Care to shine that somewhere other than my face." She perched her hand over her eyes, warding off the glare. He moved the light but not before he caught a good look at a gaping wound running from her hairline to eyebrow, covered in congealed blood. He lifted his hand to check out her injury, but stopped. He wouldn't probe a wound on one of his men's faces. As a fellow LEO-law enforcement officer-he wouldn't treat Sydney any differently. "I wanted to help. Wish I'd listened. I tripped over the body." She held out blood-covered hands. Her eyes watered as if she might cry. Man. Don't do that. Don't fall apart. He couldn't remain detached if she started crying. He'd have to empathize, maybe give her a reassuring pat on the arm. Maybe feel her pain and resurrect all the reasons he'd left his homicide job in Portland. He changed his focus. Nodded at the brush. "Show me the body." As a faint whine of sirens spiraled in the distance, she limped into tall grass, a grimace of pain marring her beautiful face. He followed, illuminating the area ahead of her. About ten feet in, she suddenly stopped. He shone his light a few feet ahead of her. Diffused rays slid over a young male lying on his back. Russ swung the beam to the man's face landing on open eyes staring into the blackness above. Sydney gasped and swung around him. She rushed toward the main path. Even though Russ knew it was a lost cause, he bent down to check for a pulse. No question, this man hadn't made it and no question about his identity. Carl Dixon, a man every LEO in the area knew from his frequent blips onto the police radar and the most recent arrest for selling drugs. All that ended with three gunshots to the chest at close range from what Russ could see with his flashlight. Once they thoroughly processed the scene, he'd know better. But first, they needed to vacate the area before further contaminating the scene. He found Sydney near the path, gaze fixed in the distance, hands clasped on her hips and exhaling long breaths as if trying to expel what she'd just seen. Russ didn't want to tell her it would do little for them in terms of searching DMV records as three digits would return thousands of bikes, but he didn't think she could take any more bad news so he kept quiet. "Let's head down to the parking lot." He gave her the flashlight and urged her to take the lead down the steep hill. Once on solid concrete, she handed it back to him. Holding it overhead, he watched her closely for dizziness or other impairments from her fall. He saw nothing out of the ordinary, but a head injury could mean a concussion. He'd have the EMT's check her out when they got here. "I'm fine " Her voice cracked and she seemed embarrassed over reacting to the murder. "I'm fine really. I'll be back to a hundred percent by morning." Thanks so much for hosting me on your blog, Susan. 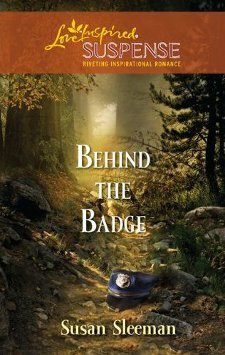 I hope all your readers will stop by my website to enter to win a $50 Amazon gift card and a copy of Behind the Badge.